One of the best things about being part of an on-line community is the sharing of knowledge/ experiences. Earlier this year the wonderful Luke ‘@bettermaths’ Graham collated a whole bunch of opinionated data on hard to teach topics in mathematics based on the new specification. The kind of topics you look at and go, ‘right… uh… ok…’ and then hammer something out but feel you’ve fallen short! Once compiled, Luke graciously offered these topics out to some of the brightest and best the community had to offer. The idea being that they could share their experiences and thoughts on the topics so as to help anyone who needs it. Clearly there was a mistake when Luke sent out the email as you’re now on my blog! (Huzzah!) Never the less I shall endure to illuminate you as best I can! I’ve spent a bit of time thinking/ researching a few different ways to attack this and my advice is going to fall into 2 different sections. Don’t worry too much about the numbers at this stage, just observe. What do you notice? My first thoughts (albeit from a maths teachers POV) was that it has a lovely oscillating vibe going on. We can see that there is going to be repetitive numbers. There has to be some kind of upper and lower boundary. There is some kind of pattern! Your students may give you all sorts of different observations! Next look at this little geogebra applet. Use this (or something like it) to promote discussion. What’s happening at 0º,45º(is it 0.5? ),90º etc. Would 60º and 300º be the same? Compare to cosine, what’s the same? what’s different? What the hell is this to do with Trig anyway?!? Section 2: The Dull remembering bit! Now your student has a little bit of insight as to what these numbers mean lets talk strategies for remembering! 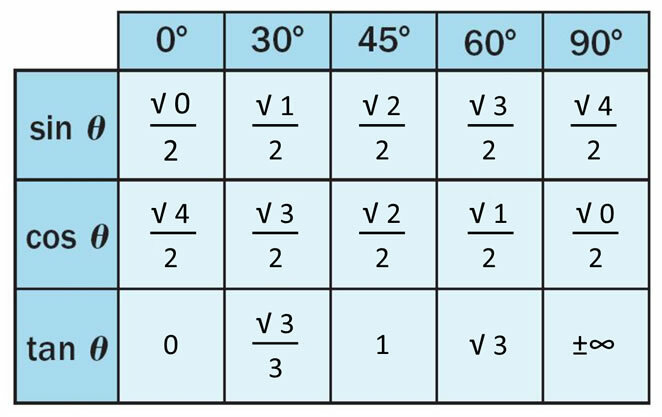 Many thanks to Lindsay Porter (@L1nd54y) for putting me onto this about 2 years back during a nice meeting with her, there’s a nice little ‘thing’ you can do to help you remember Sine and Cosine. Tan… ahhh well, that’s a little trickier. Have a look at this, see what patterns you can spot. Some of the value have been made more complicated in order to achieve the patterns here but in terms of remembering strategies I think this is a little bit nice. Ok, so we have a pretty little table. How can you get it to stick? Without resorting to perfectly mathematical yet horrible youtube songs (Sorry Paulo, I just cant get behind song based learning!) I’ve found the best strategy is just to use the damned things in as many questions as you can! Many thanks to Mel of Just Maths fame (@just_maths) for digging up this wonderfully nasty question for me! It’s from the first version of the Ed-Excel Sample assessment material and is intended to be completed without the aid of a calculator using the knowledge contained in the chart above and extrapolating it to use cos120º! 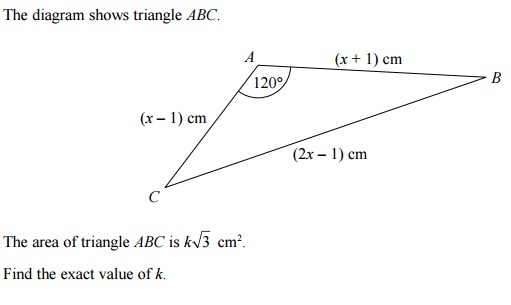 Now its going to take time to create/collate a good amount of accessible GCSE level Non-calculator trig questions but hopefully you get the idea. If you take anything away from this entry, I hope its the fact that even memorising a bunch of relativity boring numbers can be made a lot more interesting and memorable with a little exploratory work and the aid of a good couple of gifs! That said, sometimes you can’t beat a good old spot of drill and kill! No? Hi Mr Lyons… this is truly fabulous! what a rocker you are… I’ll play about with the technical bit if I may and either put a copy it across to the bettermaths site or put a mirror to yours.. I’m sure there is a simple technical way to do it!!! THANKS a 10^6 I’ll let you know what I’m doing before I do anything though so you can be ready for the glory!